Pyromet produces quality silver shot and silver grain in 99.99%, 99.9%+, and 92.5% sterling silver and can package the shot in a variety of sizes. Pyromet produces quality silver shot and grain that consists of 99.9% pure silver to maximize electric conductivity. We manufacture silver shot and grain in a variety of sizes and fineness to meet the needs of your application. A minimum purchase applies. 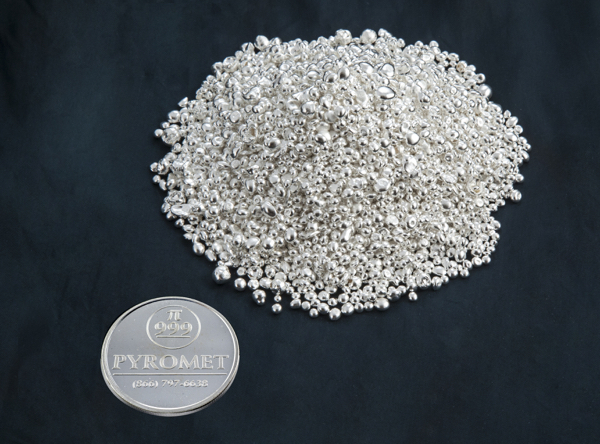 Pyromet's silver shot, or silver casting grain, is silver that has been formed into small BB sized pellets. This form of silver is typically used by alloy companies and as manufacturing solder. It is also used by artisans and jewelers who melt it to create a wide variety of products and product components, in silver ink and paint, polymer thick film, electromagnetic shielding, membrane touch switches, and the die attachment step during integrated circuit packaging. The grain's small size provides a large surface area that allows them to be melted much more easily than larger items like bars or rods. Despite its small size, the grain is still large enough to be handled with relative ease.